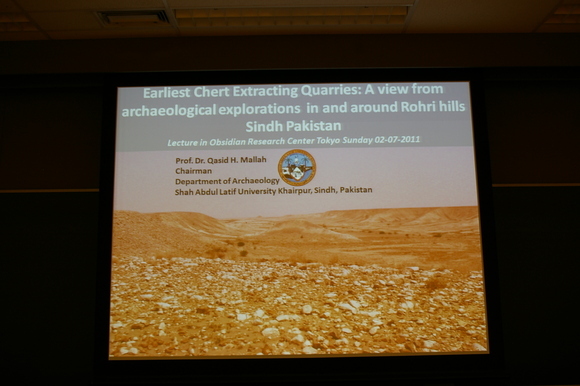 On 6th July, we have taken the 3rd lecture of Porf.Mallah, titled 'Earliest chert extracting quarries: a view from archaeological exploration in and around Rohri Hills, Sindh, Pakistan' (abstract). 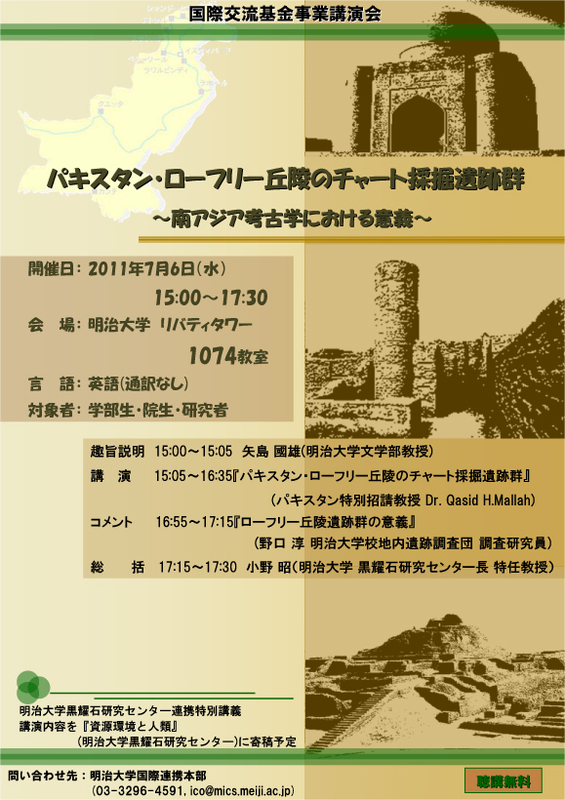 This lecture was held in collaboration with Meiji University Centre for Obsidian and Lithic Studies. 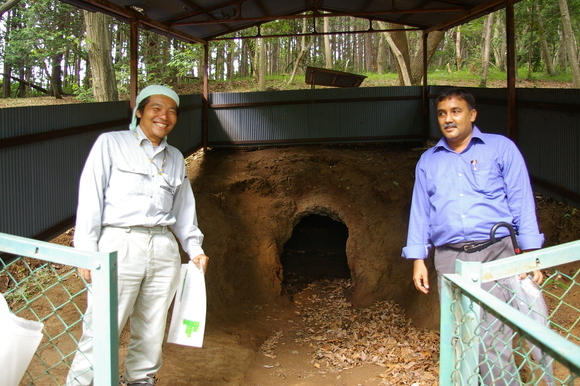 The Centre investigates Takayama obsidian source sites including cluster of Jomon obsidian quarrying pits. 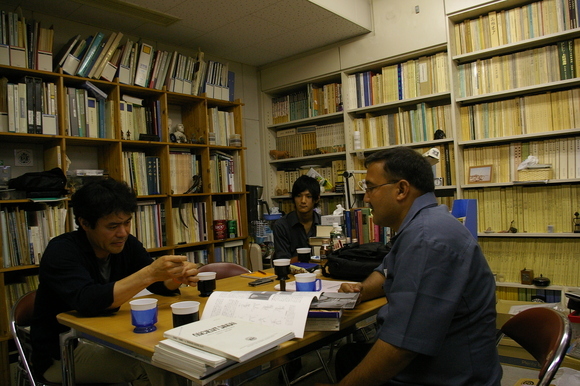 Comparative study with Rohri, Takayama and other regional cases is one of the challenges for lithic studies. 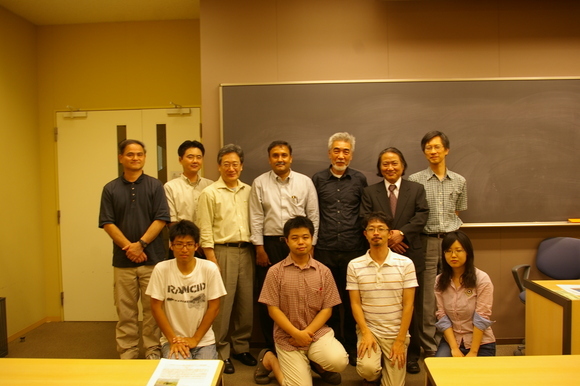 This was the last lecture of Prof.Mallah in Tokyo. 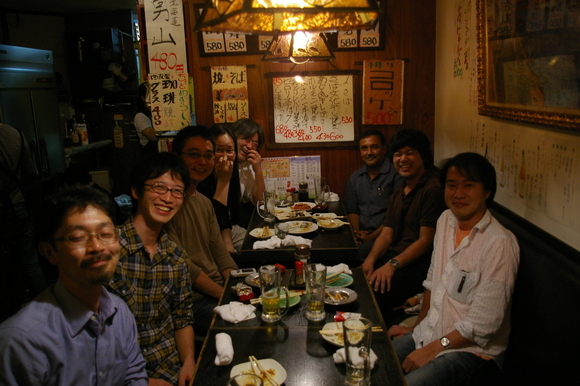 On 7th July evening, we had farewell party in a Soba restaurant at Shinjuku. 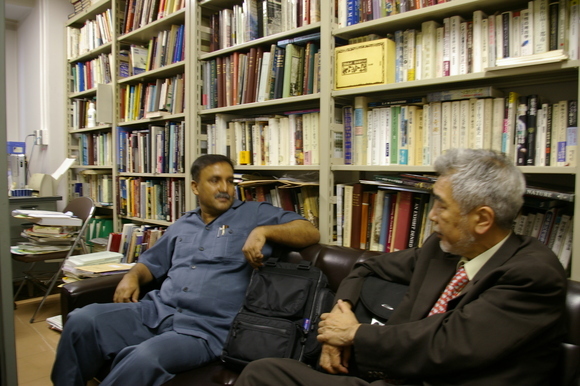 Then Prof.Mallah has left from Tokyo. 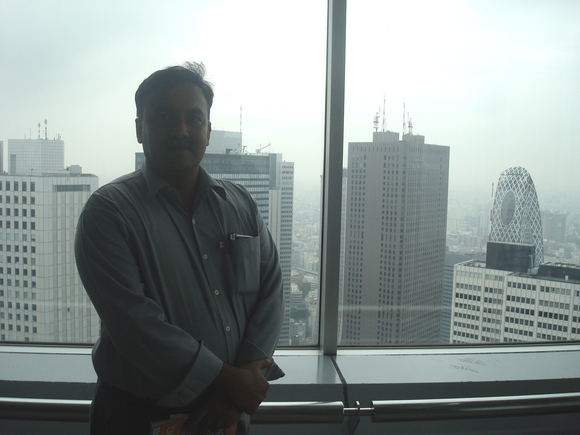 During his stay in Tokyo, we had much discussion on many issues. I hope that he got much things in Japan. ▲ by asiansophia | 2011-07-11 22:25 | 南アジア考古学/SA Arch. 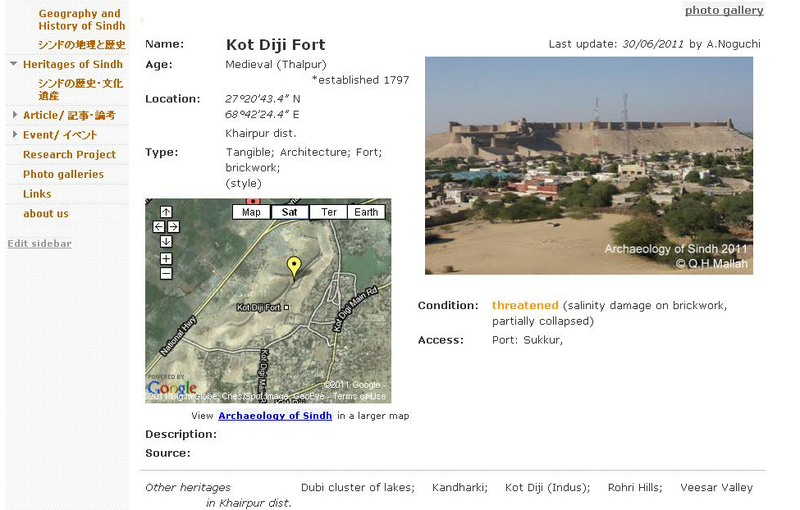 Now I'm arranging our web-site "Archaeology of Sindh" in collaboration with Prof.Q.H.Mallah from Shah Abdul Latif University, Khairpur, Pakistan. For the moment, we share only limited contents. 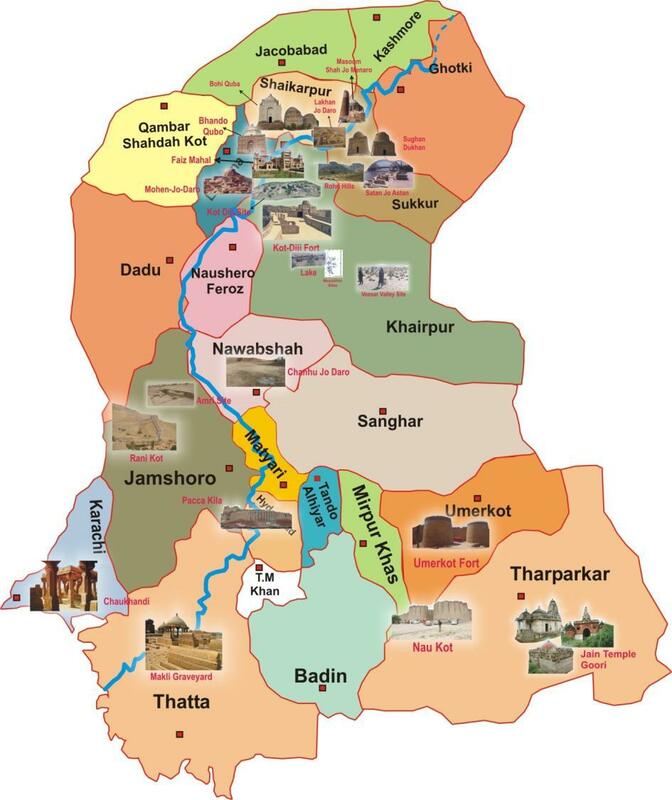 However our main focus is to construct 'Heritages of Sindh' section. Sindh has plenty archaeological sites and cultural heritages including UNESCO world cultural heritage; Mohenjo Daro site and Makri Hill necropolis complex. 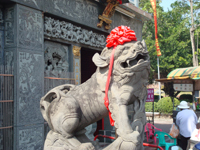 But we can touch less information of other sites, monuments or intangible cultural properties. Even some of them are faced to threat of destruction... So we plan to open our web-site for platform of sharing information. 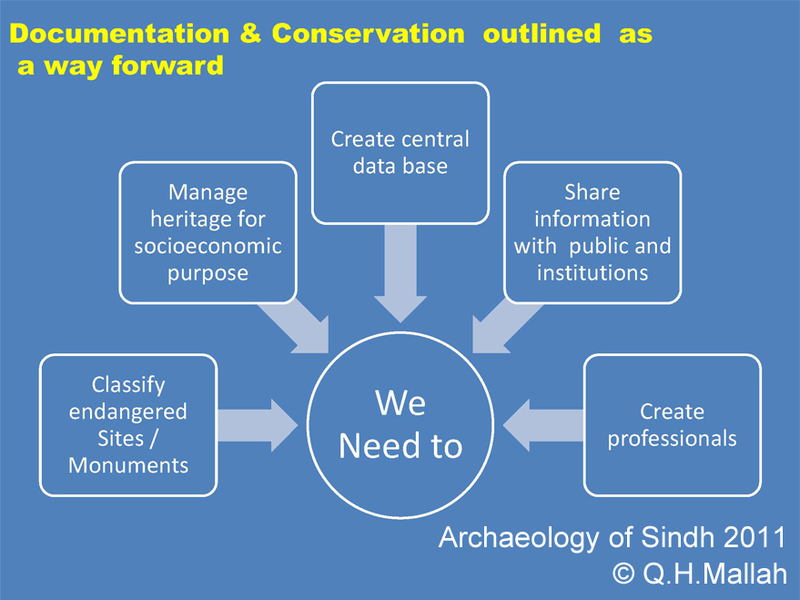 We believe this web-site will be helpful for documentation and conservation of heritages in Sindh. We will arrange clickable map (as shown above) and other index, then basic information of each sites, monuments or intangible cultural properties as sample screen capture. Now I'm arranging photos for archive and location of each sites. Also we ask some expert to improve our description. 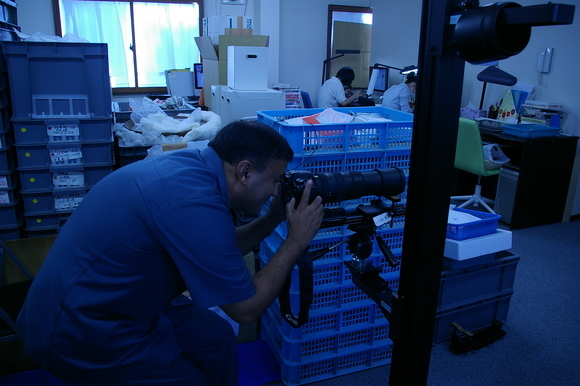 It is not easy work for us. But we are eager to complete it. Please wait for a moment. We will share a part, step by step. And if you want to join us, please make contact. We welcome all people those who are interested with Archaeology, History and Arts of Sindh!!! ▲ by asiansophia | 2011-07-03 02:25 | 南アジア考古学/SA Arch. 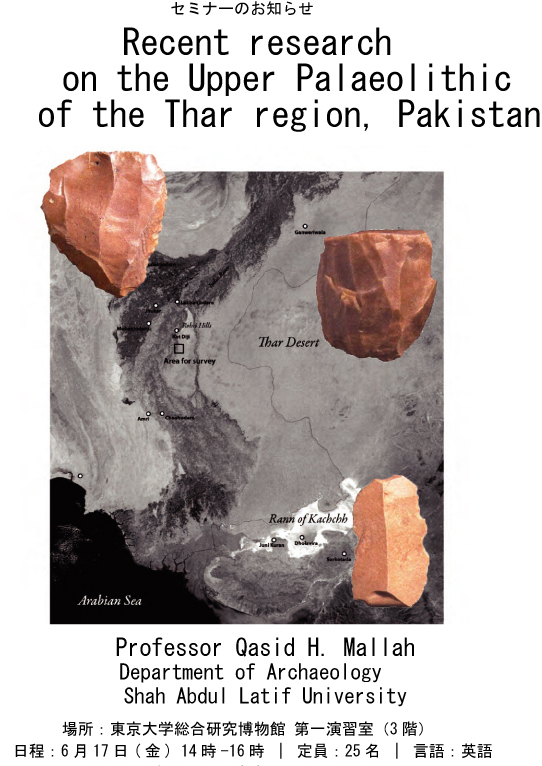 On 2th July, we have taken the 2nd lecture of Prof.Mallah, titled "An Overview on the Recent Archaeological Research in Northern Sindh, Pakistan". 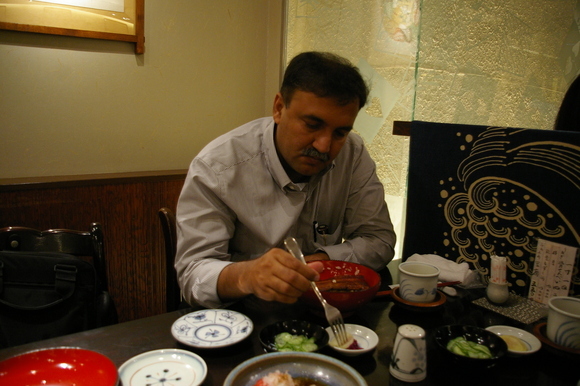 Before lecture, we had lunch at Unagi (eel fish) restaurant at Shinjuku. How it taste? 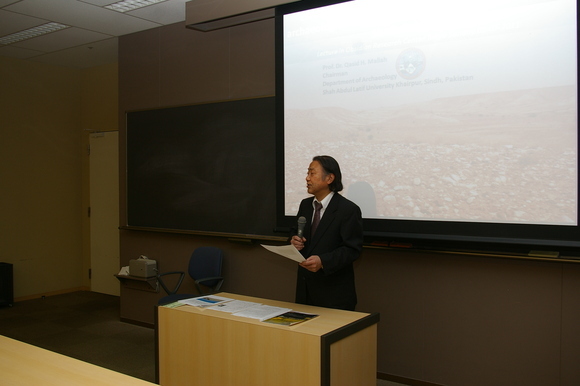 The lecture focused on archaeological investigations of Indus age sites in Thar desert and Indus Plain. I cannot show detail here. It will submit to the journal of Indo-kouko-kenkyu. 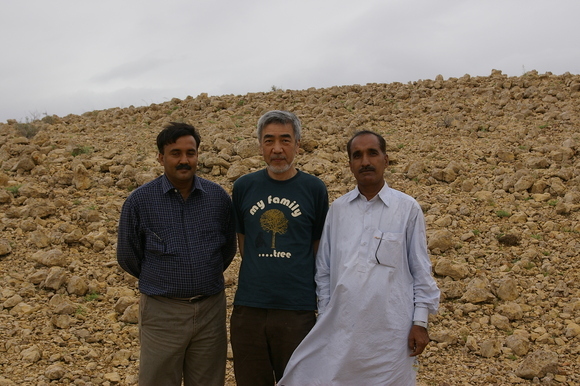 Prof. Mallah and his department continue the exploration in Thar Desert and find out so many sites especially along Nara, assumed ancient Hakra River. These are including beads workshop and copper processing sites. Also Prof.Mallah shew us their achievement at Lakhan-Jo-Daro site in Sukkur district. They uncover some Indus seals and other objects with scripts. The site is so rich. Now we know there are another "city" in Indus Plain during Mature Harappan period. 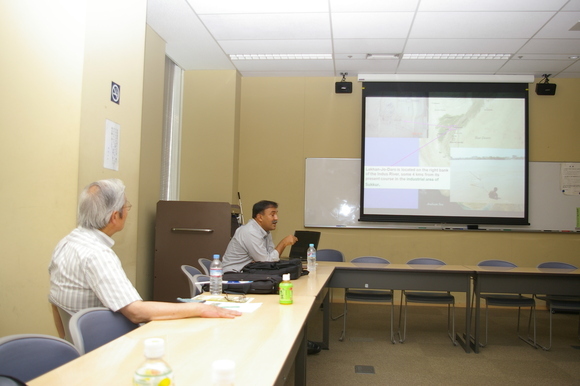 After brief comment by Prof.Kondo, we discussed on some issues; course of ancient Hakura River and environment, possibility of river transportation, and nature of sites in Thar Desert area. 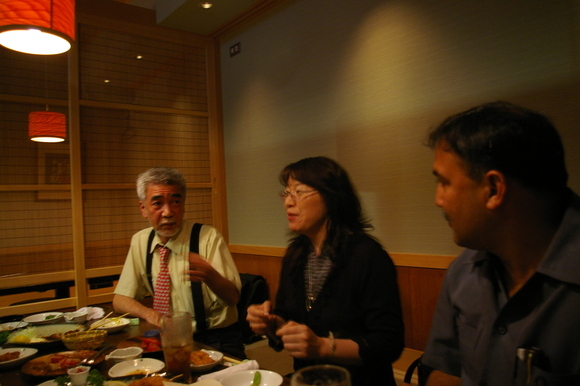 Then we moved to restaurant to have dinner and to continue discussion. 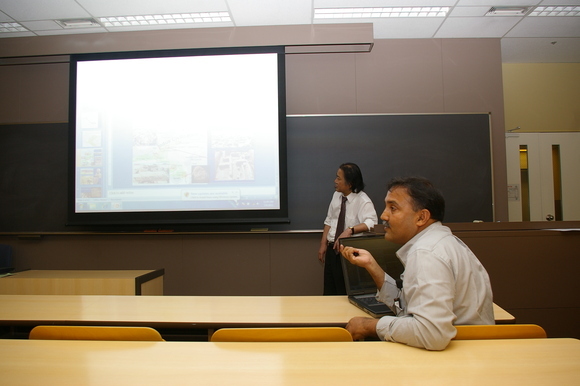 It is also rich and excellent lecture. Thank you Prof.Mallah-san! ▲ by asiansophia | 2011-07-02 22:10 | 南アジア考古学/SA Arch. 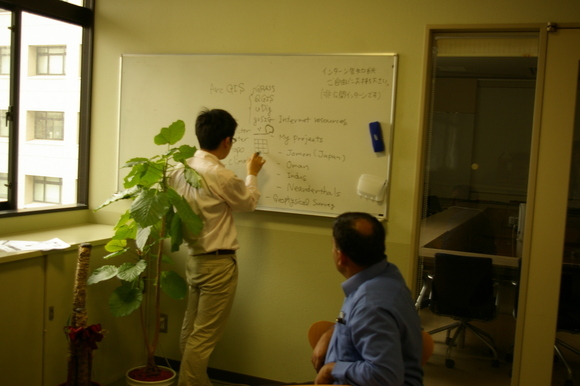 On Thursday, we have been to Ibaragi Prefectue, to visit Mitsui Kousoku Co.,Ltd. It is a measurement survey company specialized to archaeological investigation and cultural heritage management. 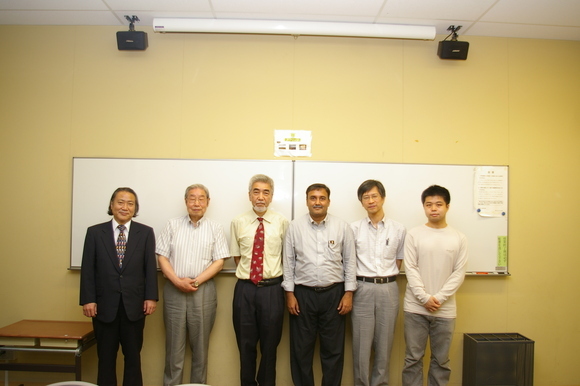 Mr.T.Mitsui, CEO is on the left side, Prof.Mallah is on the right side of the photo. 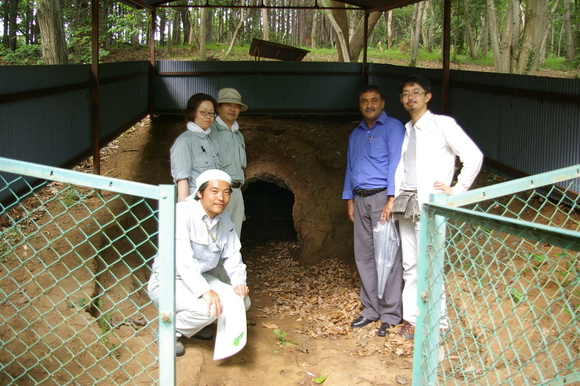 Centre is Mr.T.Kawaguchi, archaeologist from the educational board of Mito City. Our first aim to visit them is this 3D laser scanning system. They introduce a compact and reasonable product of NextEngine. It seems suitable for measurement and documentation of artefacts. 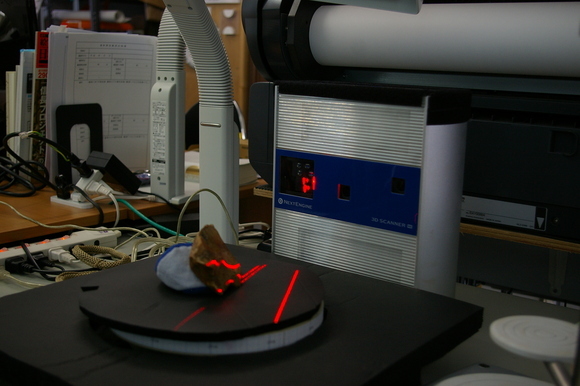 On a sample case of stone tool, time cost of all procedure (including measurement and alignment) was about 20 minutes. Then we can get 3-dimensional model of stone tool. This will help constructing multi-dimensional digital archive of artefacts. We were wandering its potential and future. The company also has rich experience in total survey procedure for investigation and management of archaeological site. After brief instruction, we have visited their practical case; Kawarazuka roof tile kiln cluster site at Ishioka City, Ibaragi Pref. 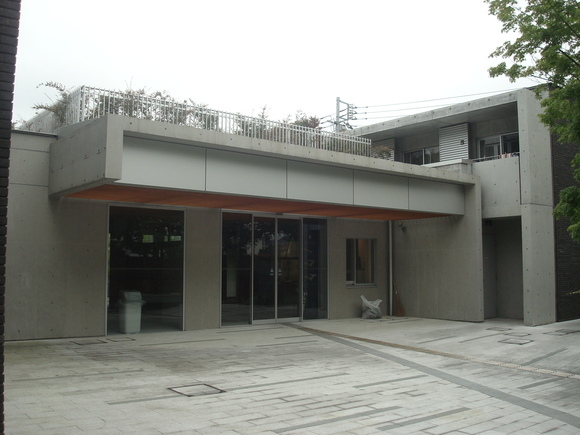 The educational board of Ishioka City is now carrying investigation and preservation project on the site for those 5 years and Mitusi Kosoku Co.,Ltd. provide wholly support for measurement survey. The man who covered his head with blue cloth-Mr.Daisuke Kosugiyama is the archaeologist working on the project (and he is junior of my department...). 4) some kiln are preserved after excavation to open public, other kiln are re-buried for protection against weathering or erosion. In future, they will extend their investigation area for searching workshops and settlements. Also they are planning to arrange observatory of kiln, museum and other facility for public. 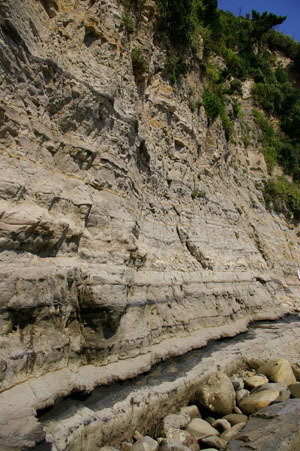 The site is situated in well-preserved landscape. They will achieve so many efforts, I believe. ▲ by asiansophia | 2011-07-02 10:30 | 南アジア考古学/SA Arch. 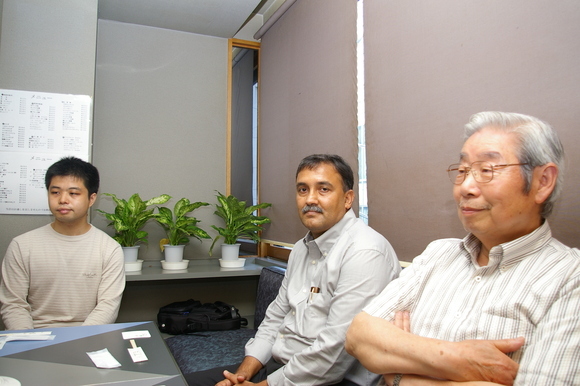 On 28th June, we have visited Archae-Research Co.,Ltd. at Itabashi ward, Tokyo. By the way...nowadays we have many commercial based company those which engage archaeology especially in preventive excavation. Some are general company which contract all procedure of excavation and documentation. Some are providing workers and machineries. some are contracting specific operation, such as measurement survey, aerial photography, scientific analyses, taking photos and drawings and so on. Archaeo-Research Co.,Ltd. is one of commercial based archaeological company. 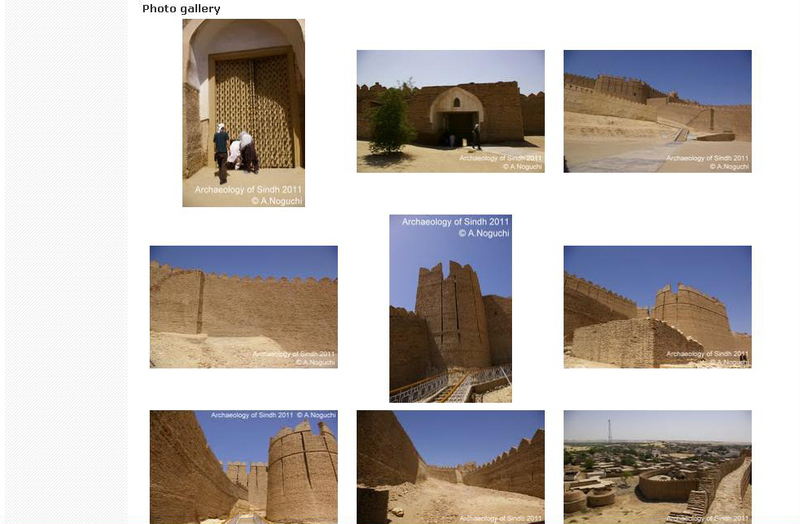 They innovate their original photography system easily taking orthographic projected photos of artefacts. Core of their system is very simple; composed with turn table and 2 mirrors. Those 2 mirrors project both dorsal and ventral surfaces of artefact. Turn table can be set by each right angles accurately. 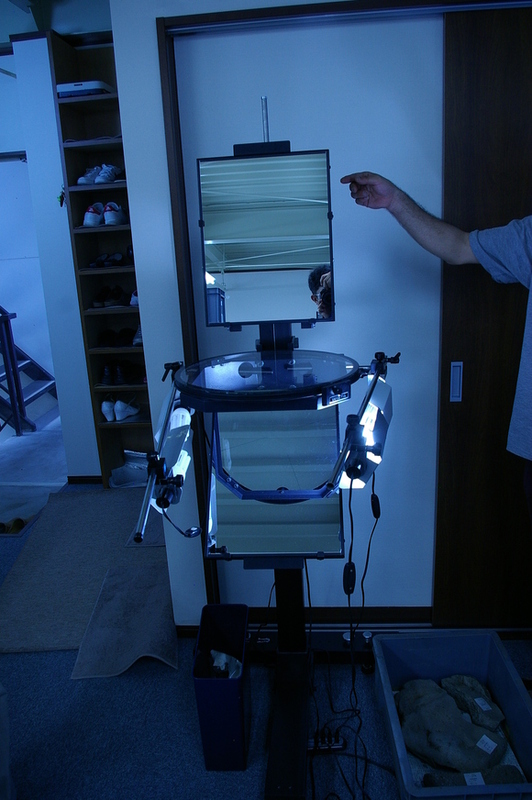 Moving camera up and down on stand, then we can take dorsal and ventral surfaces and side view. After turning table by each right angle, we can take 4 side views. 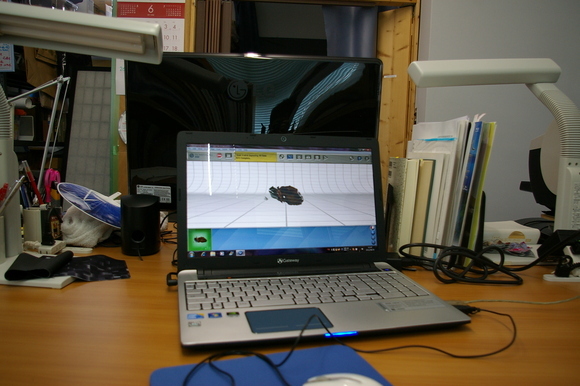 Then arranging those photos on PC, we can get accurate orthographic projection of artefacts. It is easy to draw outlines by directly tracing photos on pen tablet. Arrangement of photos or drawing outlines are available by commercial graphic application; such as Adobe Photoshop, Illustrator and so on. ▲ by asiansophia | 2011-06-29 23:56 | 南アジア考古学/SA Arch. 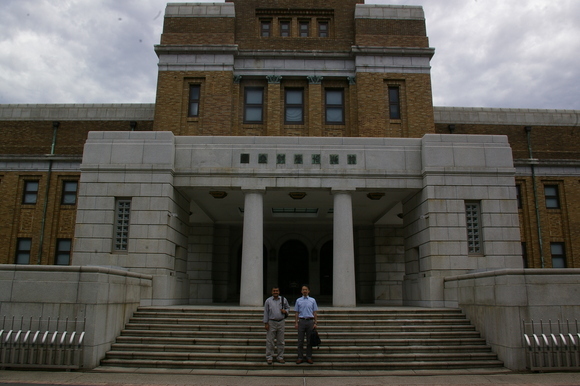 On 22 June, we have visited National Museum of Nature and Science at Ueno. The museum has rich collection and exciting exhibition. 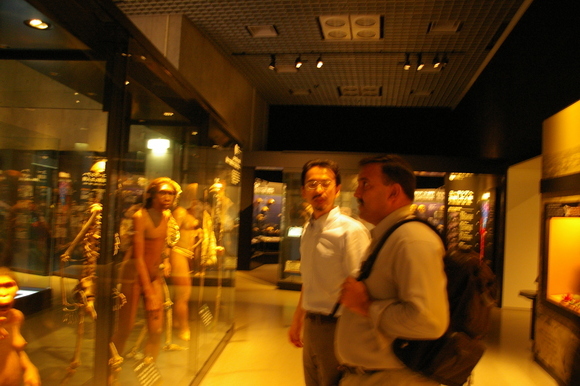 At first we looked exhibition of anthropological section with guidance of Dr.Kaifu who designed this updated exhibition. Then we looked around exhibitions in new building. 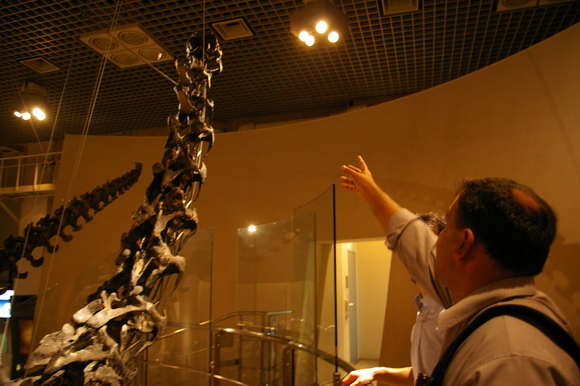 Prof.Mallah look up a reconstruction model of huge dinosaur skeleton. We spent around 2hours in the museum. 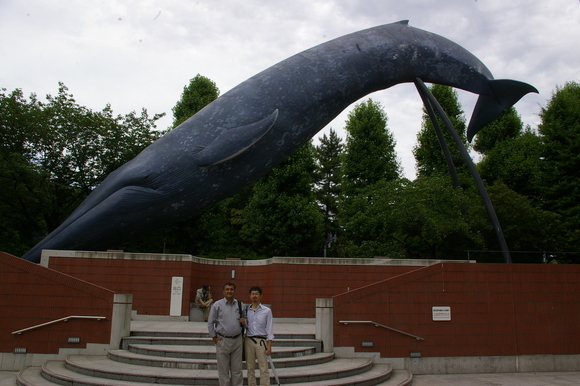 This is a real-size statue of Fin Whale in front of the museum. We have moved to Asakusa after lunch. Kaminari-Mon was occupied so many tourist even though weekday. There are many souvenir shops along approach pavement to Senso-ji Temple. Prof. Mallah got something for himself and his family. 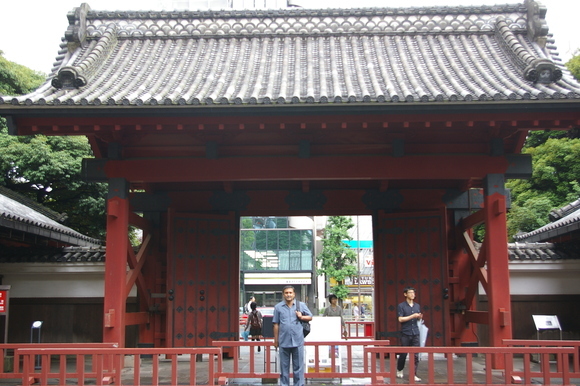 This is the main entrance gate of Senso-ji . 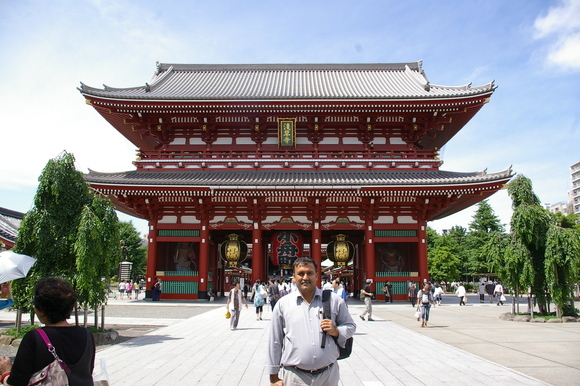 The temple is the one of the oldest Buddhism temple in Tokyo. It was very famous religious centre once. 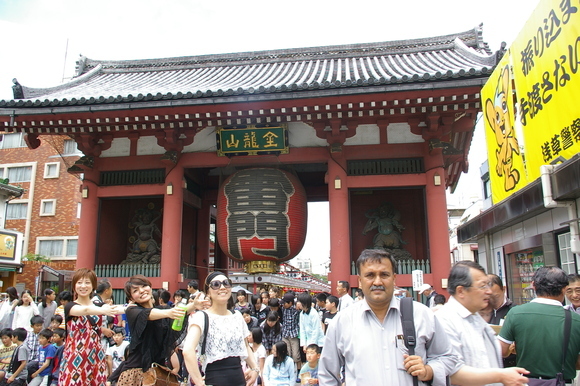 Nowadays, it become a centre of tourism in historic Tokyo city. 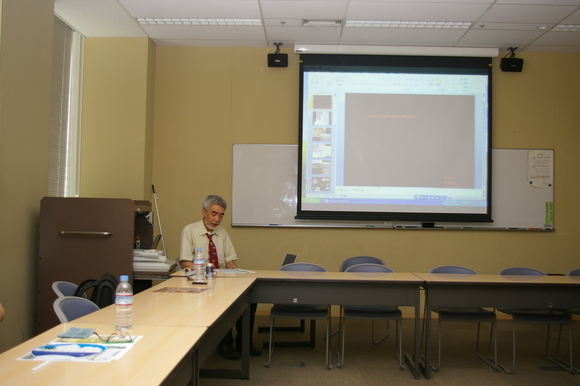 On 26 June, Prof.Mallah have given lecture on 'Preservation and Management of Cultural Heritage in Sindh, Pakistan: problem and perspective' (see abstract) at Meiji University. 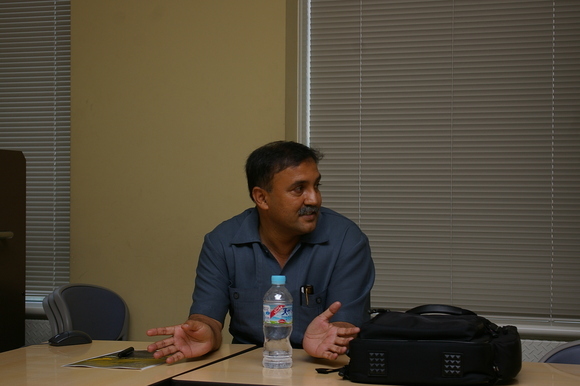 It was really excellent lecture. 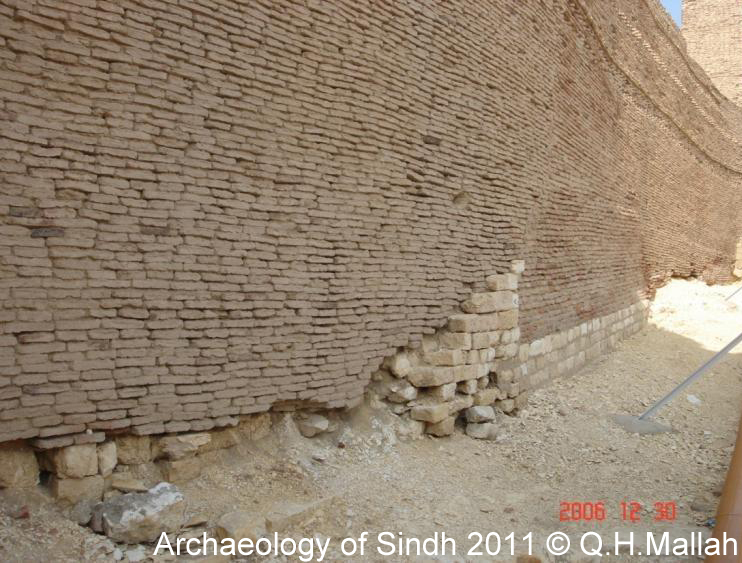 We knew difficult condition of heritage in Sindh, caused by destructive development, academic negligence and natural agency (especially salinity effect). 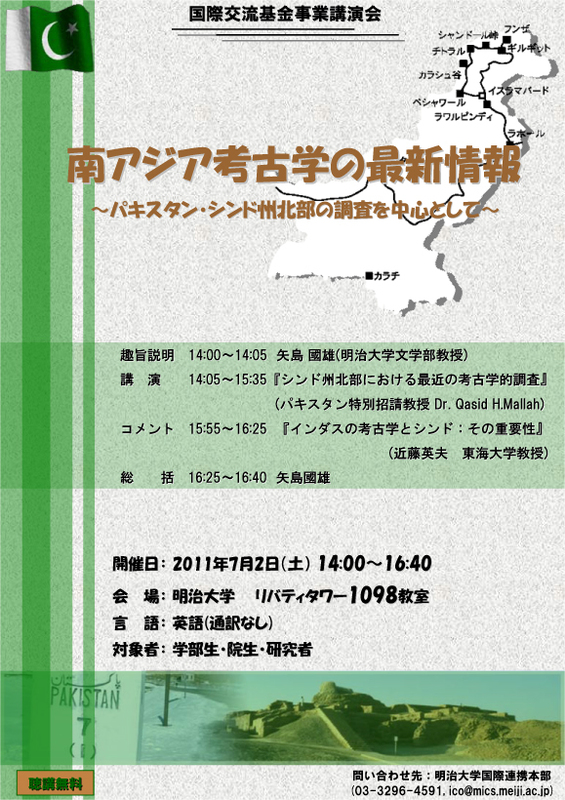 The lecture will be published from Meiji University and we will upload it on our web-site. Please wait a moment. ▲ by asiansophia | 2011-06-26 22:44 | 南アジア考古学/SA Arch. 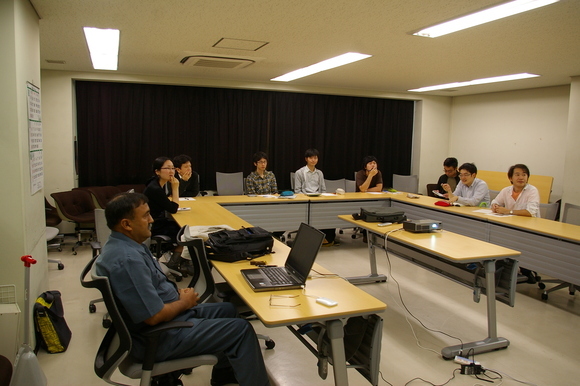 Now we're arranging to open abstracts of those lectures on internet. I will update further information soon later. Also papers concerned with those lectures will be published in journals and proceedings (Japanese translation or English). ▲ by asiansophia | 2011-06-22 11:38 | 南アジア考古学/SA Arch. 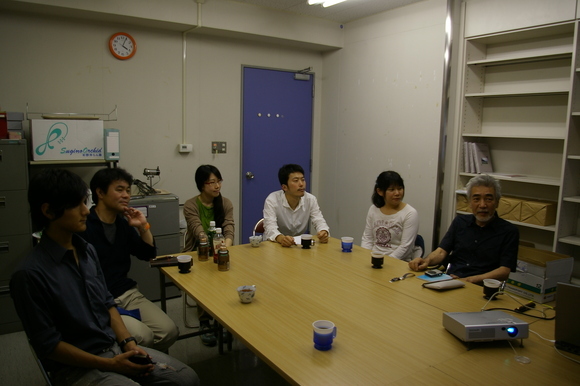 On 16th, we have visited Dr.Yasuhisa Kondo's labo in Tokyo Institute of Technology. 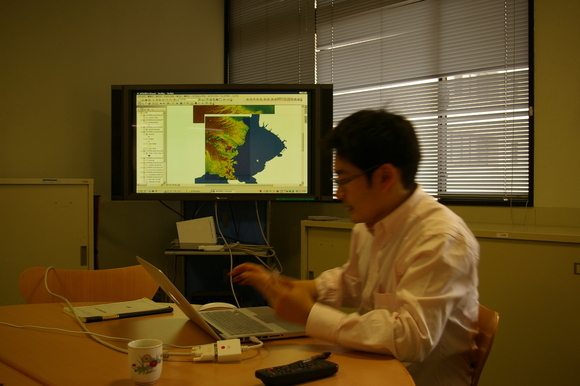 Yasuhisa is one of vigorous GIS archaeologist in Japan. 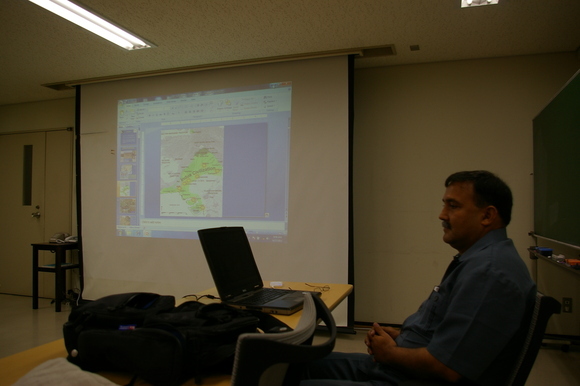 He gave brief lecture on application of GIS to Prof.Mallah. If you are interested with Yasuhisa's work, please visit his web-site (click here). Prof.Mallah puts on a serious expression. He is very eager to introduce GIS into his department. 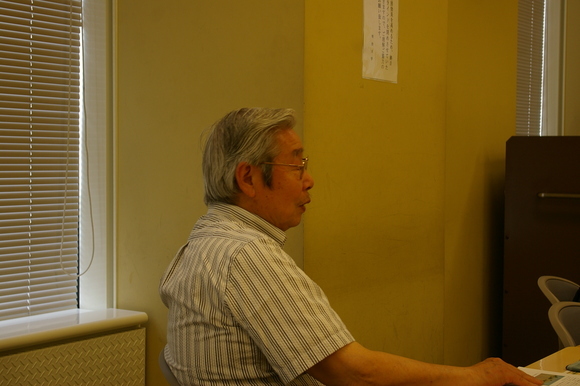 Then we take a brief presentation of Prof.Kamei, expert of geophysical probing of archaeological site, GIS and database). 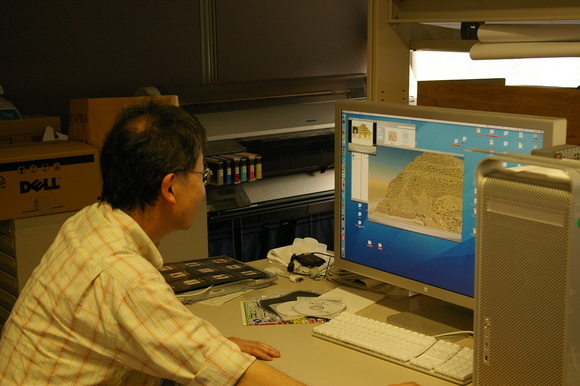 Prof.Mallah is fascinated with Prof.Kamei's incredible work on digital 3-dimensional reconstruciton of Ancient Egypcian Tomb. On 17th, we have visited the University Museum, the University of Tokyo, to see their exhibition. This is the famous Akamon, preserved entrance gate for former Daimyo's residence　established in 1872. 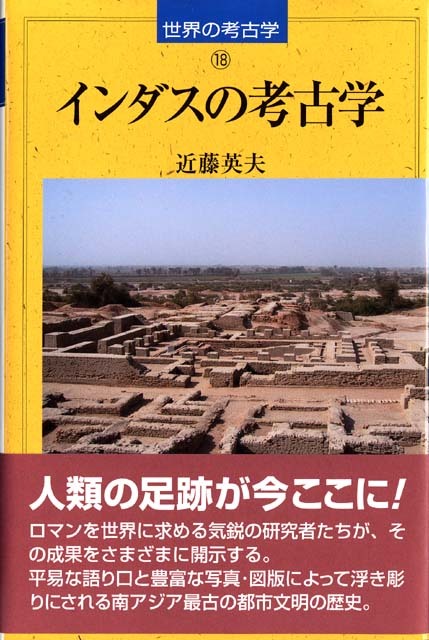 With kindly regard by Prof.Nishiaki, the Archaeological Dept. 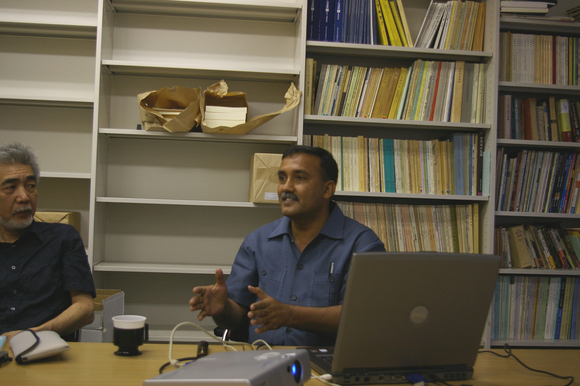 of the Museum, Prof.Mallah gets opportunity to give lecture for graduate students and research fellows. 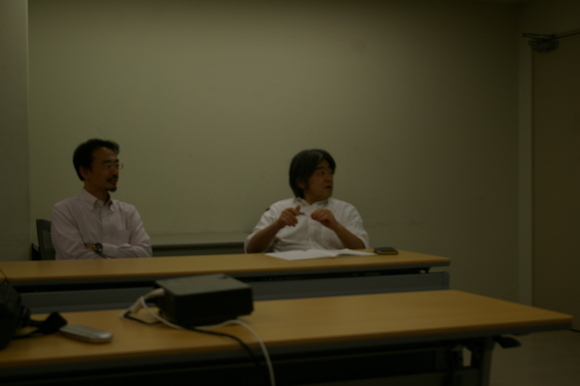 Prof.Nishiaki and Dr.Kaifu from National Museum of Ｎature and Science. 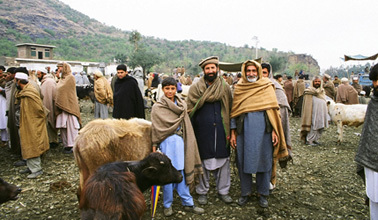 Prof.Mallah and participants. The lecture is focused on Palaeolithic and Mesolithic in Rohri Hills and Thar Desert. All participants are very eager, so Prof.Mallah is really honored to give his lecture to them. Then we are walking within the university campus for an hour. 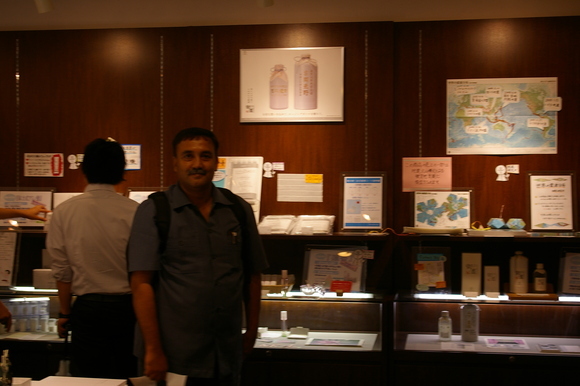 Prof.Mallah gets some souvenir in special gift shop of the university. After we have dinner nearby the university. It was also exciting days for us. Thank you for all concerns! ▲ by asiansophia | 2011-06-17 23:58 | 南アジア考古学/SA Arch. 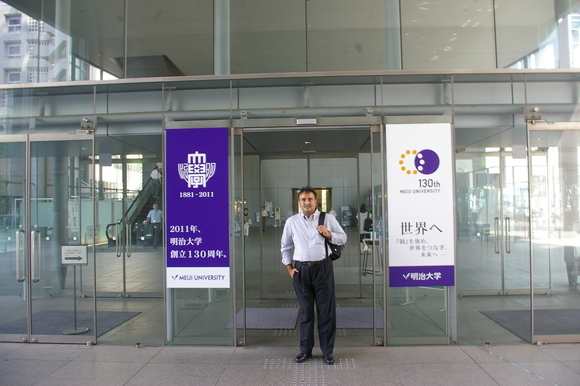 Prof.Mallah has arrived at Narita International Airport on 12 June. We invite him by International Exchange Programme of Meiji University(MU) for a month. Now he stays in new-opened MU Izumi International House. It is at Meidai-mae 5minutes off Shinjuku. On 13th, the first day in Tokyo, we have dropped in Tokyo Metropolitan Government Building on the way to Meiji University Main Campus,. Unfortunately it was foggy so we couldn't see clear view from 220m above sea level...It wasn't possible to see Mt.Fuji. 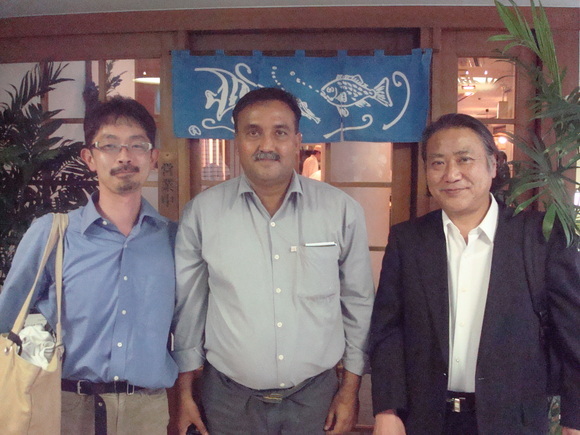 At Main Campus of MU, Prof.Mallah met so many people...then we; Prof.Yajima as host of invitation, Prof.Mallah and I were coming to the famous Tempura Restaurant in the Hilltop Hotel. 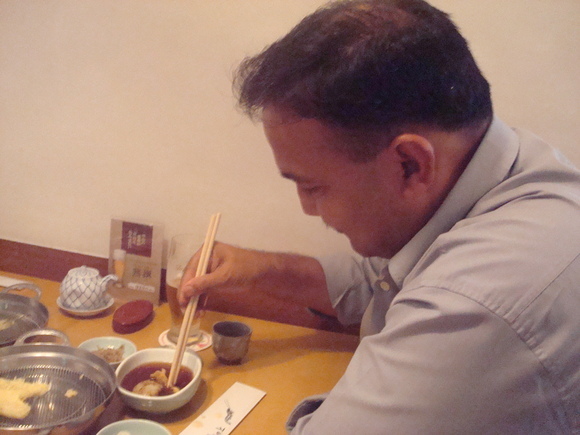 Prof.Mallah is very excellent to use chopstick. We had a course of Tempura. 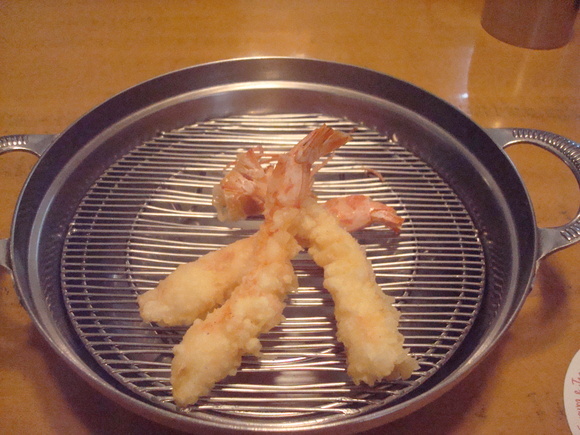 This is Japanese tiger prawn. 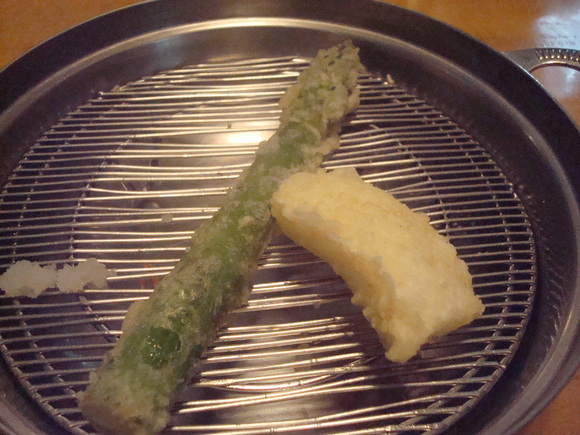 Green asparagus and squid. After, sillago, Megochi (Suggrundus meerdervoortii), onion and bell pepper, then conger. We were fulfilled with those tasty Tempura and fruitful conversations. On 14th, we have visited Ancient Orient Museum, Tokyo to see their exhibition and to meet Dr.Uesugi. 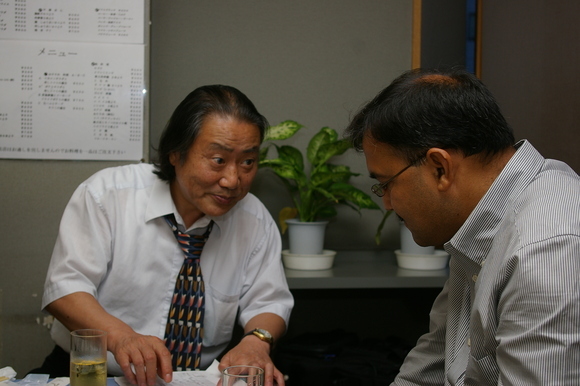 Prof.Mallah was pleased reunion with Dr.Uesugi. 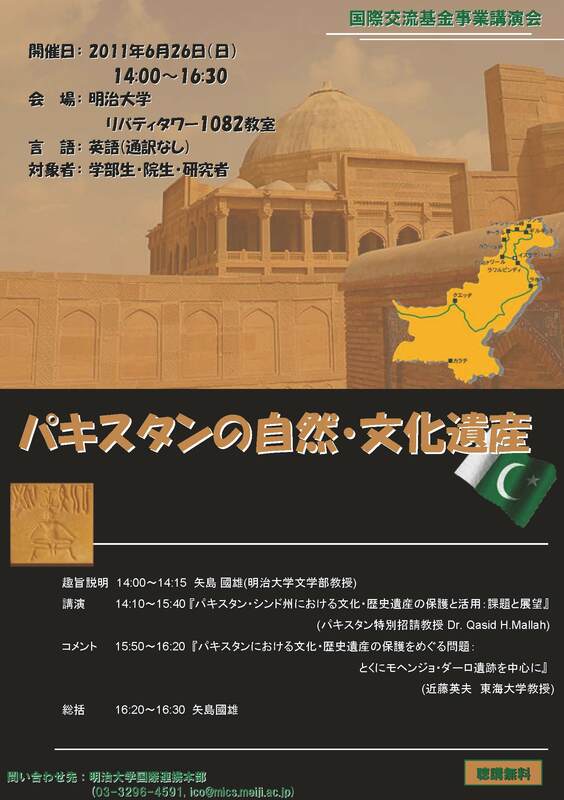 On 15th, Prof.Mallah gave special lecture on the general view of pre- and proto-historic studies of Pakistan, in Tokai University. 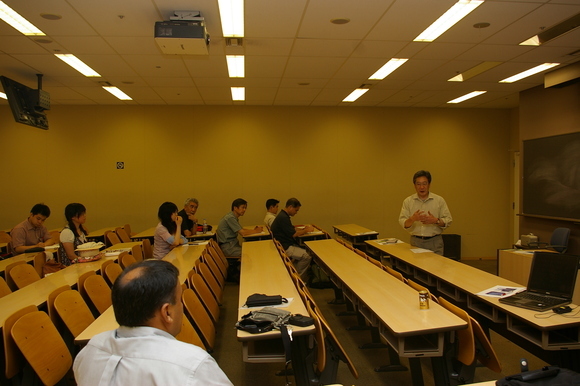 It was well-arranged lecture. So we could know the essential of Pakistani archaeology. 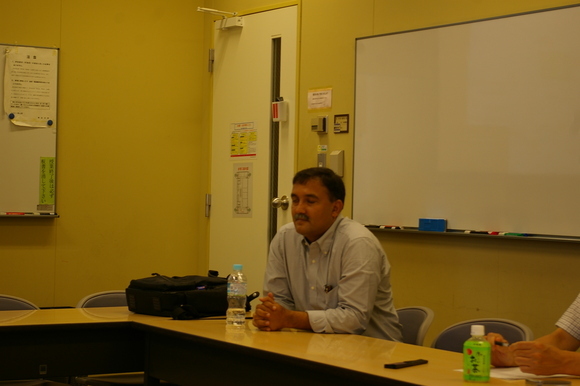 After his own lecture, Prof.Mallah took a short but special lecture with experiment on Jomon cord-marking by Mr.Miyahara, a lecturer of Tokai University. 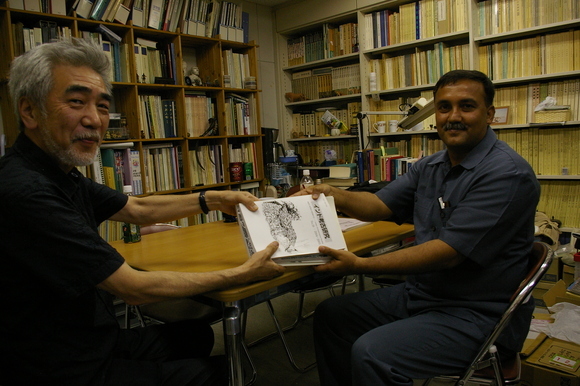 Then Prof.Kondo, as the president of Indian Archaeology Society of Japan, gifts volumes of the journal Indo-kouko-kenkyu to Prof. Mallah. Then we had our dinner at popular chain restaurant. 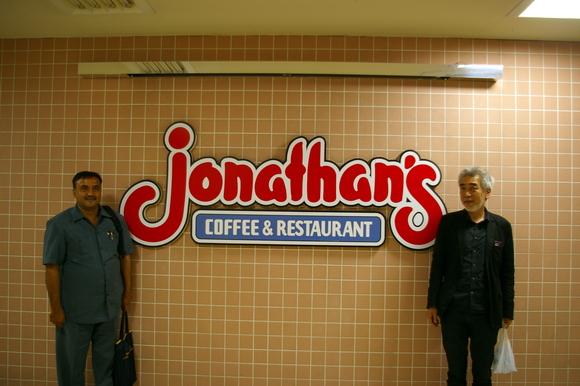 Prof.Mallah was very interested with the name of restaurant...it is 'Jonathan's'. So this is very funny picture...Jonathan's professors. ▲ by asiansophia | 2011-06-16 21:57 | 南アジア考古学/SA Arch. 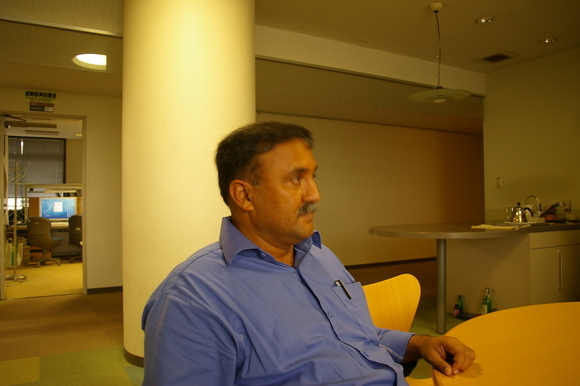 A friends comes from Pakistan- Prof.Qasid H. Mallah from Shah Abdul Latif University Kharipur, one of the most active Indus archaeologist in Pakistan (see special issue in Science) is invited by International Exchange Programme of Meiji University. 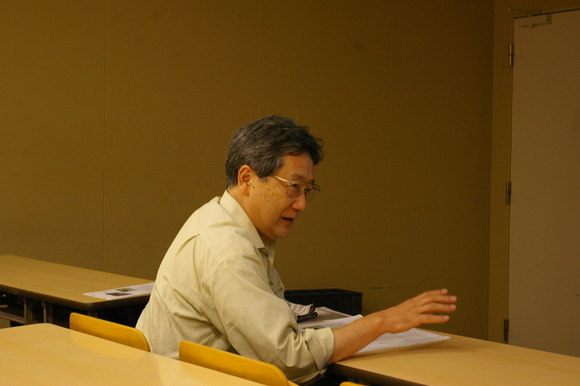 He will stay in Tokyo until 9 July and give us 4 time of lectures. 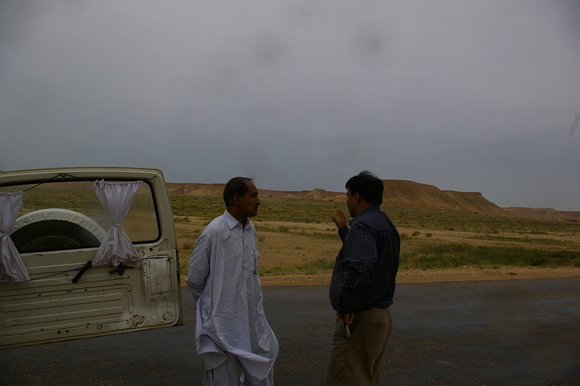 Ｉｔ was March, 2007 to see him at Khairpur. 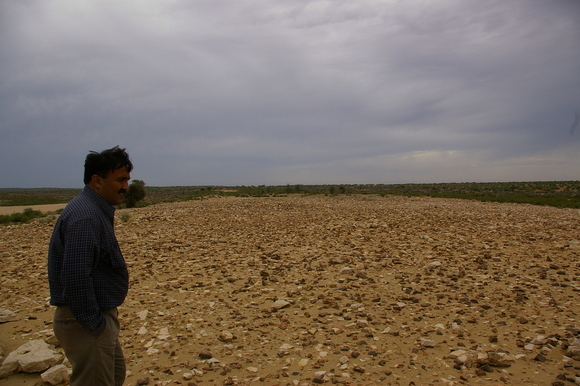 He guided us to Palaeolithic~Indus sites in Thar region. It was really memorable experience for us with Prof.Mallah's exciting driving. ▲ by asiansophia | 2011-06-15 11:42 | 南アジア考古学/SA Arch.